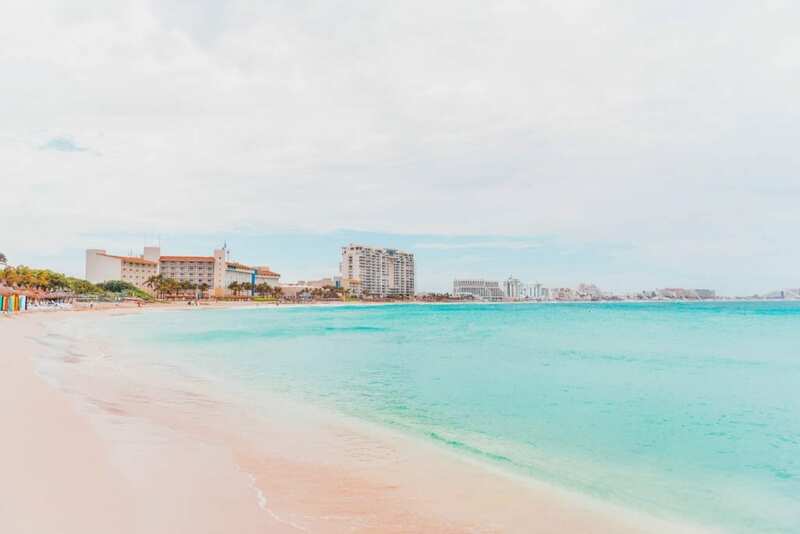 While most know the Yucatan Peninsula for its largest city, Cancun, it has far more to offer than a raging spring break party. 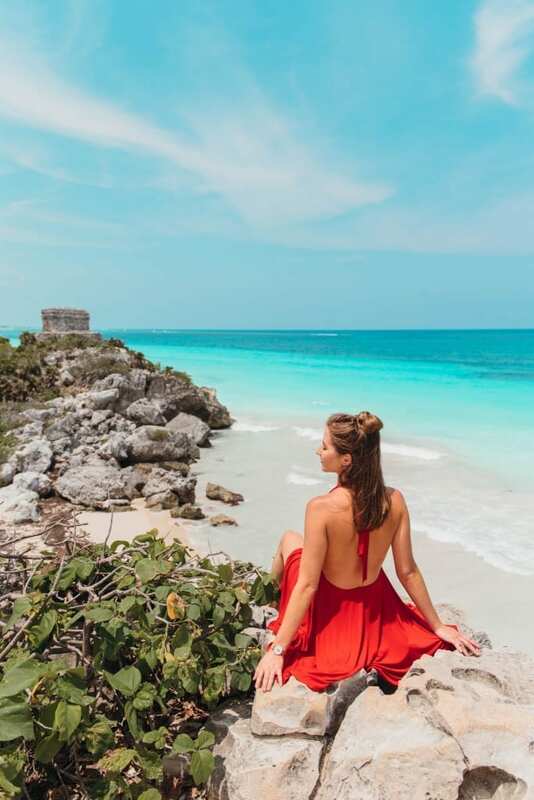 The Yucatan has Caribbean blue waters cascading over white sand beaches, 5-star resorts, ancient Maya cities, underground rivers, whale shark diving, sea turtle swimming, and a nightlife to rival Las Vegas. 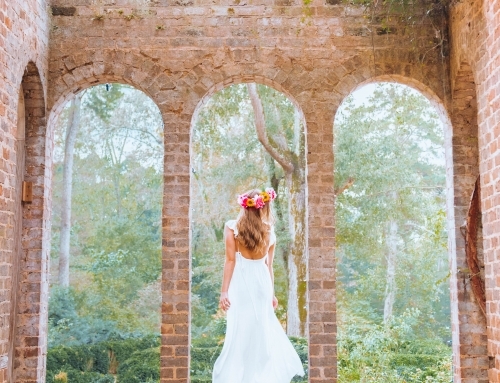 No matter what mood you are in, the “place of richness” can accommodate. Below is the Ultimate 3-Day Yucatan Peninsula Itinerary. This was my first time to the eastern coast of Mexico, so I learned a good amount throughout the trip. Be sure to keep an eye out for my TIPS. After landing in Cancun around 9:00 a.m. and renting a car, we went off to explore the Yucatan. Our first day we visited a cenote, Tulum, and Coba. We drove 30 minutes from the airport to our first stop at the Cenote Verde Lucero (click HERE for directions). TIP: Rent a car. Driving around the Yucatan may seem daunting to some, but it is no more stressful than driving in LA. Rental cars are cheaper than most tours and give you the freedom to go where you want when you want. As you drive down Ruta de Los Cenotes, you will pass many cenotes so keep your eyes peeled for the correct sign, which will be on the left side of the road. Once you find the entrance, you’ll drive on a dirt road till you see a building and gravel parking lot. Just park your car, pay the entrance fee, and you’re in. What’s nice about this cenote is that there are bathrooms, chairs, tables, and lifejackets. However, make sure to bring your own food and beverages. Lucky for us when we arrived, there was no one else around to enjoy this emerald pool. What was unique about this cenote was the zip line!! You can ride down and drop into the glistening green waters. There is even a rock ledge about 20 feet above the water where you can jump off if you feel like a dare devil. The Cenote Verde Lucero has a maximum depth of 66 feet/20 meters and the average depth is 35 feet/10.6 meters, so it is plenty deep to jump into. While it was beautiful, this was not my favorite cenote. If you don’t have time to see it, don’t feel bad. Next, we traveled 1.5 hours to Tulum (click HERE for directions). Parking for a car is $120 pesos, this has recently gone up, bordering on ridiculous. TIP: Talk to one of the restaurants along the road to the ruins. One of them let us park behind their shop for free as long as we ate lunch there. This is also an opportunity to load up on water (you’ll need it). If you are visiting during the summer, prepare to sweat. It’s a long walk to the ruins and an even longer walk around the ruins. You can access the beach from the ruins (see below pictures), but unless you plan on spending an afternoon in the water, the sun can beat you down. Bring lots of water and a hat at the minimum. TIP: Bring your bathing suit or better yet, wear it under your clothes so you can jump in the water. It makes for a fresh break from walking around the ruins. There are no changing facilities by the beach (only the bathrooms by the ticket booth). We didn’t do a formal tour of the ruins, and I’m not sure it’s necessary. The ruins are spread out and they do have some information plates before the large buildings to give you some insight into the culture, history, and importance of each area of the town. It didn’t take me long to find out that there isn’t much known about the Maya people. Since they disappeared so quickly, even archeologists and historians are still trying to decide what the Maya culture was all about. This means most of what you read or hear from tour guides are educated guesses at best. From many murals and other artistic works around the city, Tulum appears to have been an important site for the worship of the Diving or Descending god. 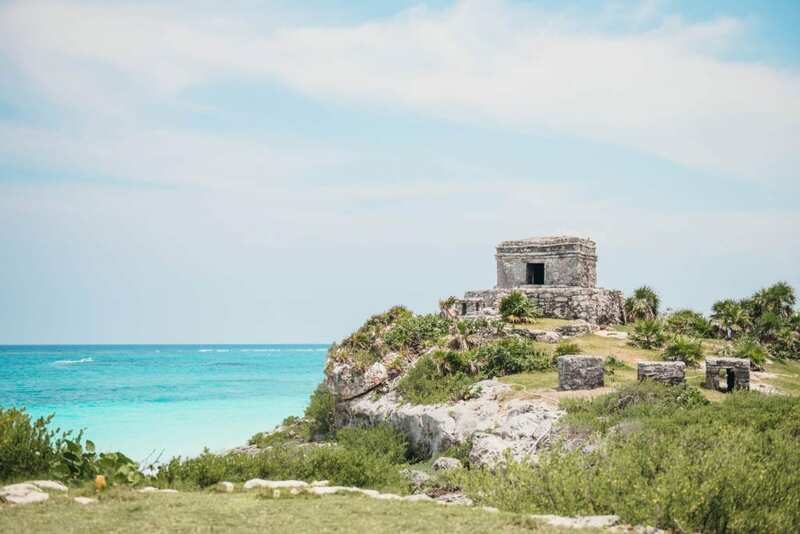 Tulum may formerly have been known by the name Zama, meaning City of Dawn, because it faces the sunrise. There was an estimated population of 1,000 to 1,600 inhabitants. 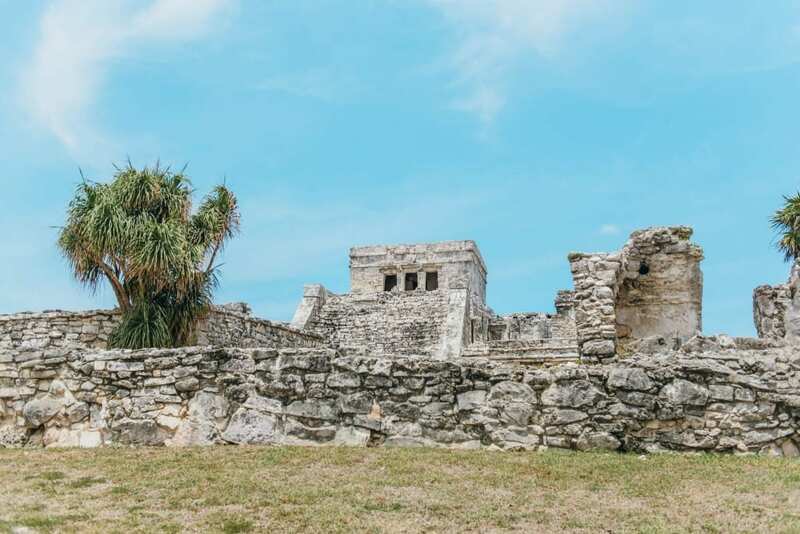 Tulum was one of the last cities built and inhabited by the Maya, and served as a major port for the city of Coba. 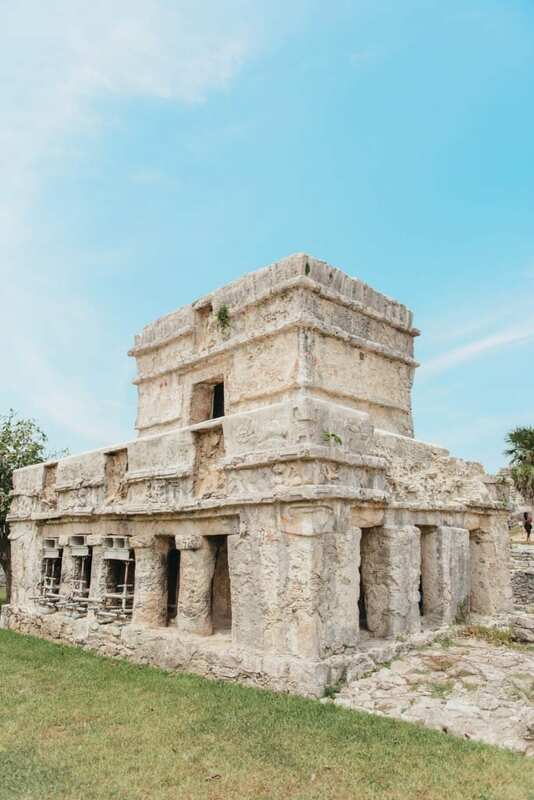 At its peak between the 13th and 15th centuries, Tulum managed to survive about 70 years after the Spanish began occupying Mexico. As you may or may not know, I LOVE Iguanas. Just one more reason why I loved exploring this ancient city! 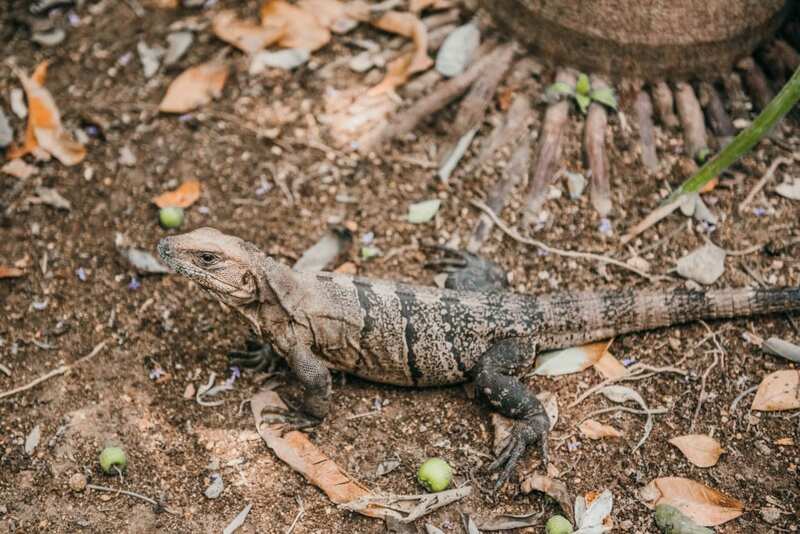 There are literally hundreds of iguanas around the ruins. My husband thinks the Maya people were cursed and turned into iguanas (hence why they disappeared so quickly!) I don’t think he’s right, but the sunbathing lizards still make for some awesome shots laying around these extremely old ruins. Also, watch out for snakes! A little fella jumped straight out of the bushes along one of the walkways at me! It was startling, to say the least. 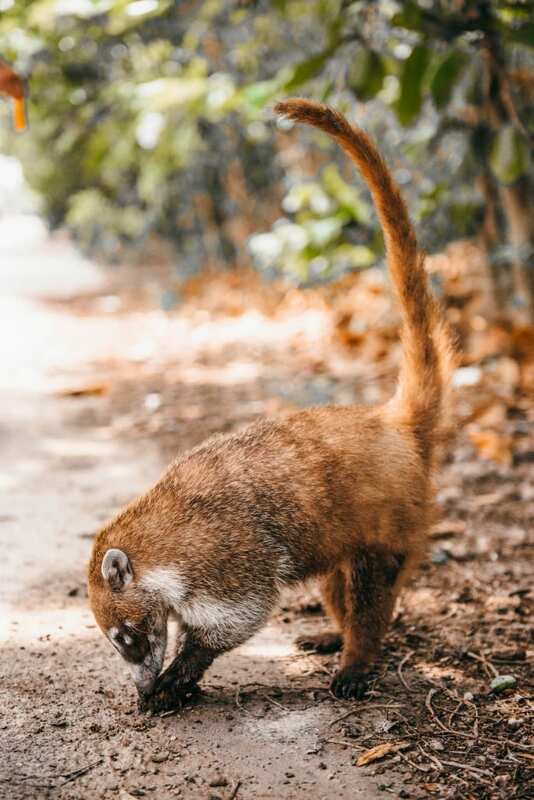 TIP: Don’t forget to keep an eye out for the white-nosed coatis too! These furry little guys tend to hang out around the gate (where they can find some food from tourists). Tulum blew our expectations out of the water. I was only expecting a few buildings by the beach, but there were so many more! The animals and beach were just perks. 100% worth the effort and money to see these 13th-century ruins! Around 2:00 p.m. we headed North to visit the ruins of Coba (click HERE for directions). TIP: As it is everywhere in the Yucatan, it gets hot during the day at Coba. I highly suggest you visit early morning or late afternoon. The crowds will be smaller as well! Archaeologists believe Coba was an incredibly important city to the Maya people. Coba’s power came from its control over agriculture, trading routes, and water. However, the development of Chichen Itza after 600 A.D. shifted the political influences in the Yucatan Peninsula. By 1000 A.D. Coba became more of a spiritual and religious site than the commercial powerhouse it once was. 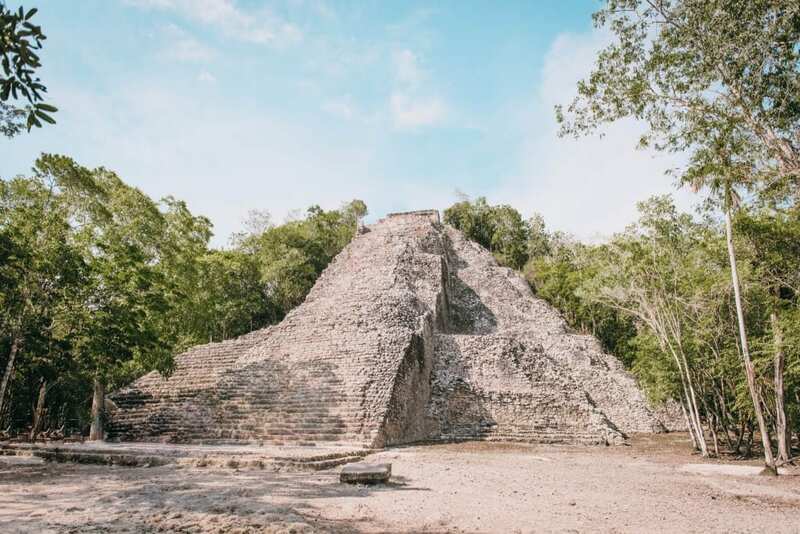 Fast forward a few centuries, the city of Coba remained a mystery until the 1920s! It is surrounded by an extremely thick forest in the middle of the Yucatan. Even after excavation in 1972, most of the buildings remain buried in the jungle and natural debris. To this day, the site is not as popular with tourists as other ruins in Mexico due to its remote location. 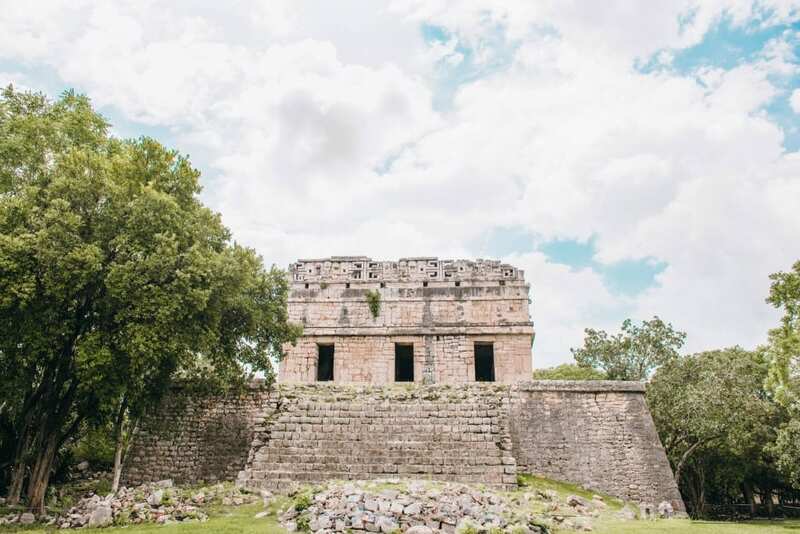 Since Coba doesn’t see as many tourists as places like Chichen Itza or Tulum, you can actually still climb to the top of the Nohoch Mu pyramid for a once in a lifetime view. The pyramid is 138 feet/42 meters tall with 120 stone steps to the top. It is a lot steeper than one would think and the steps are slippery, so climb with caution! TIP: When visiting Coba, wear closed toed shoes. Between walking, biking, and climbing, you don’t want exposed feet! If you’re a little scared of heights, don’t worry! There is a thick rope that runs up to the top of the pyramid for you to hold onto. We actually saw several elderly individuals making the climb (albeit somewhat slower). 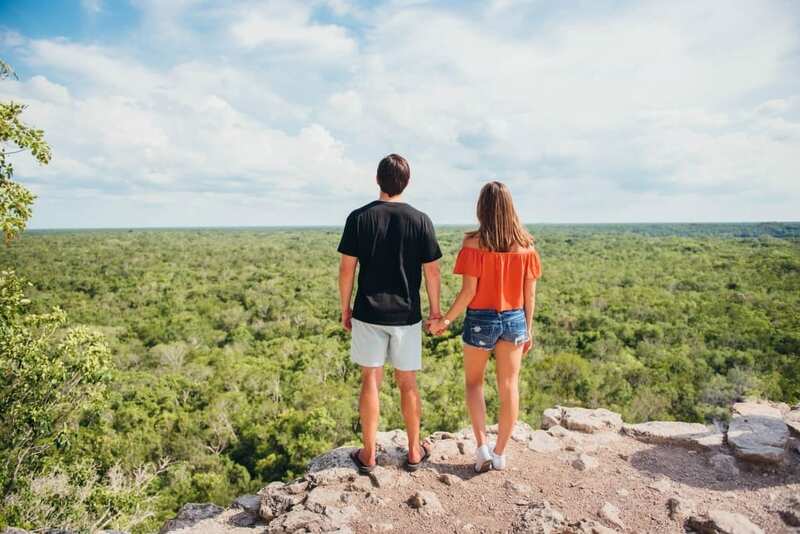 Once you reach the top, the views are unlike any others in the Yucatan. The Yucatan is densely covered in forest and relatively flat, so any high lookout like the pyramid will give you a fantastic viewpoint. There are few pyramids in the world that you can climb (legally) so be sure to do so if you visit Coba! While visiting Coba, you’ll find yourself on large white roads known as sacbes. These roads connected Coba to many other cities throughout the Yucatan Peninsula; making it possible for the Maya to both trade goods and sustain political connections with one another. Over 50 of these roads were discovered at the site, with 16 of them open to the public. TIP: You can explore on foot, but I recommend renting a bike at the entrance. The ruins are spread out. It’s nearly a 30-minute walk to the main pyramid without stopping by other ruins along the way, so it will save you time if you rent a bike. Plus, the breeze will help keep you cool. We left Cancun at 6:00 a.m. to arrive at Chichen Itza right when the gates opened (click HERE for directions). Word of warning, Chichen Itza is about 2 hours and 200km away from Cancun. Be sure you have enough gas! We nearly ran out. You’ll see signs claiming “Gas Station in 100km”. This is the equivalent to our signs of “Last Gas For 100km”. Keep that in mind if traveling by car. TIP: Most tour buses start to arrive around 11:00 a.m. In order to miss the crowd and beat the heat, make sure to explore Chichen Itza in the early morning. As close to a guarantee as I can give you, Chichen Itza will be the highlight of your trip to the Yucatan. Not only is Chichen Itza one of the Seven Wonders of the World, but it is also in amazingly good shape for its age. From the intricate snake carvings to the ginormous ball court, what the Maya people accomplished is incredible. 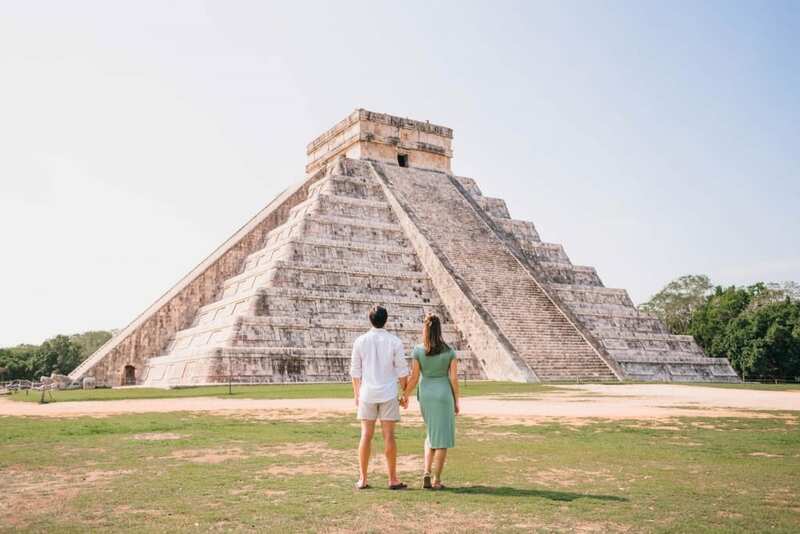 We spent more than three hours exploring the grounds, and that was without an official tour (which are offered in nearly every language spoken given Chichen Itza’s global popularity). TIP: Since it’s so humid and you’ll be walking around for hours, make sure you stay hydrated. Every couple of hundred feet or so, there are vendors selling drinks and snacks. Make sure to get some and take a short break before continuing to explore. Did you now that the Maya wrote thousands of Codices filled with their history? Such codices were the primary written records of the Maya civilization. However, conquistadors and Catholic priests during the 16th century destroyed all but 4 of the codifies. This is the very reason why we don’t know much about the Maya people. 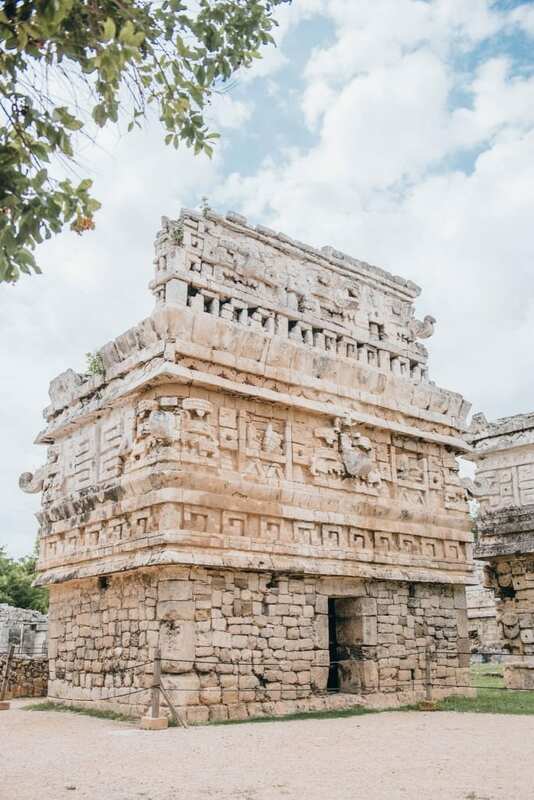 Even so, it is amazing to wander through ancient cities like Chichen Itza and imagine what each building might have been used for and what it would have been like living in these cities. The actual name “Chichen Itza” means “At the mouth of the well of the Itza.” The itza are believed to have been an ethnic-lineage group. El Castillo, also known as the Temple of Kukulcan, dominates the center of this ancient Maya city. It is typically the “pyramid” that comes to mind when one thinks of Chichen Itza. Sculptures and carvings of serpents are found everywhere around this ancient city. During the Spring and Autumn equinoxes, the sun strikes off the northwest corner of the Temple of Kukulcan casting a series of triangular shadows against the northwest balustrade. This creates the illusion of a serpent winding down the pyramid. People travel from all over the world just to see this phenomenon. The Ancient Maya were great athletes. 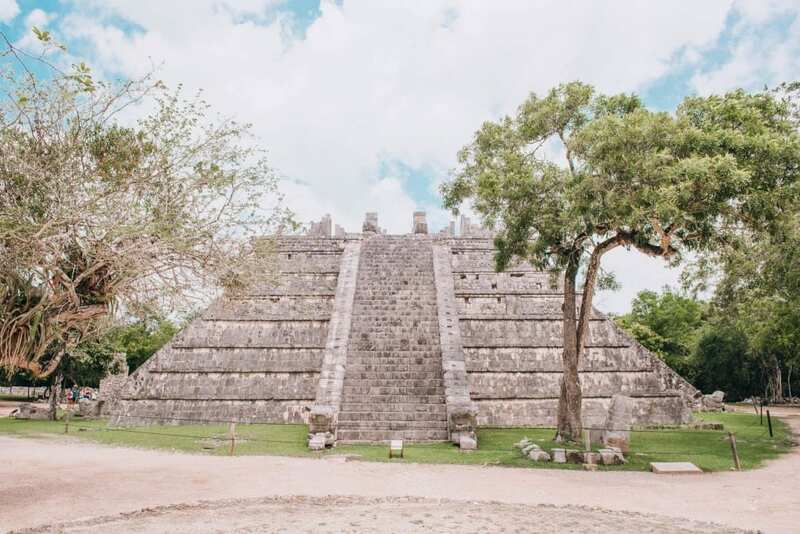 Archaeologists have discovered thirteen ball courts for playing the Mesoamerican ballgame in Chichen Itza. El Caracol (pictured above, left side) was one of the most important temples in Chichen Itza and it is one of the most unusual ones. Archaeologists believe it served as a kind of astrological observatory with doors and windows aligned to perfectly view astronomical events, specifically around the path of Venus. While it is not the most photogenic body of water in the world, the Sacred Cenote has an aura around it which makes the 1/4 mile walk from the pyramid 100% worth the effort. The Sacred Cenote was a place of sacrifice. Both human and material. The losing team from the ancient Maya ballgame, called pitz, would frequently walk this sacbes to their death. It was an honor to die in such a fashion. When the pool was excavated they found human remains, gold, and many other items. You can almost sense the history when you look into the deep green pool at the bottom of the 20ft or so drop. 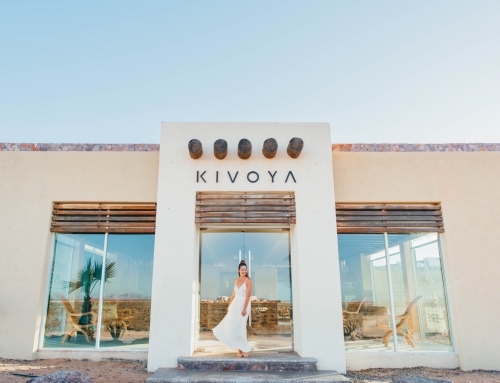 TIP: If you like to bring back gifts from your travels this is an excellent place to shop. Local vendors will flank the sides of the white road leading to the Sacred Cenote. They are happy to bargain with you on their silver, hand-carved masks, statues, and topaz jewelry. While the Maya people were extremely advanced in certain aspects, we cannot forget they held some of the more barbaric rituals of the ancient Central American people. The Sacred Cenote is an eerie reminder of this fact. A happier body of water, Ik Kil was a welcomed cool spot after a few hours of walking in the heat. We left Chichen Itza around noon and made our way to Ik Kil, the most famous of the cenotes (click HERE for directions). 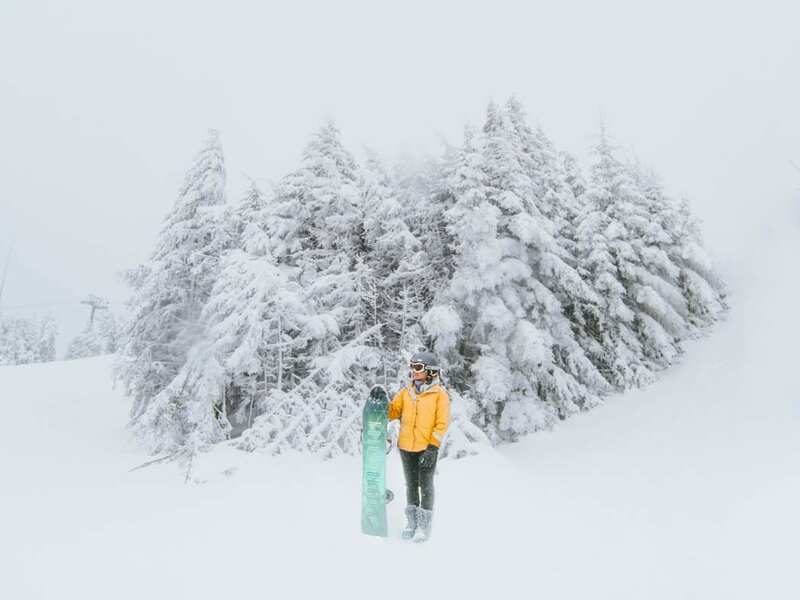 TIP: I’ve said this many time, but go early to miss the crowds. However, if you have to choose between seeing Chichen Itza or Ik Kil when it opens, go to Chichen Itza. The crowds will be worse at Chichen Itza. Plus, it’s nice to go swimming in a refreshing pool after walking in the heat. Out of all the cenotes we visited, Ik Kil had the best facilities: a hotel on the property, cabanas, a restaurant, bathrooms, lockers, lifejacket and snorkel rentals, and outdoor showers. We arrived just before the tour buses, so there was no line getting our ticket. Ik Kil Cenote, or the Sacred Blue Cenote, is about 130 feet deep and 85 feet from the surface. 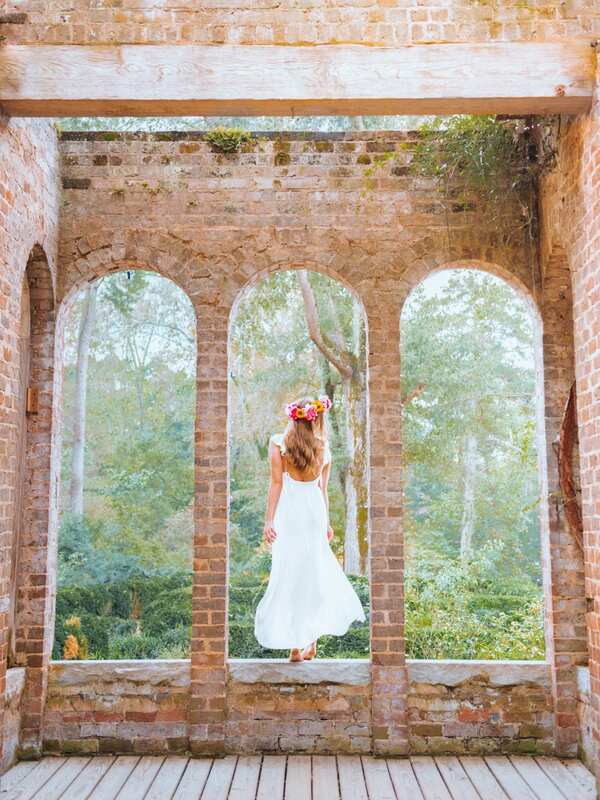 Don’t worry, there is a stairway that leads you down to the water. This amazing sink hole has beautiful vines hanging down to the surface of the water and small, albeit man-made, waterfalls cascading down into the blue waters. Swimming around beneath the surface are gray catfish that are certainly not shy. They’ll swim right up to you and touch your feet! Down in the cenote, there are multi-leveled ledges on the side where you can plunge into the cool waters. There wasn’t much of a line so we were able to jump in a couple of times from the different platforms. Check out the video below of Layton and I jumping in! After only being there for half an hour, groups of people started to arrive and the cenote was quickly filling up. That was our cue to head out. TIP: While Ik Kil is amazing. There aren’t many great spots for photos. When you are going down the stairs to the water, keep your eyes out for “windows” into the pools. 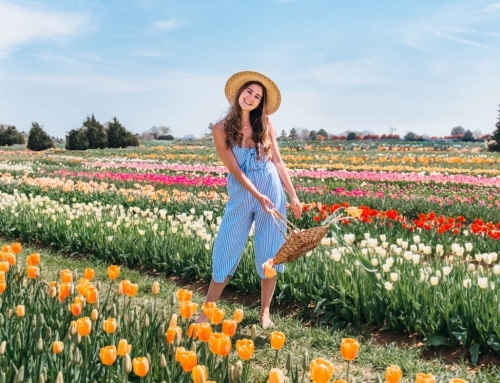 This may be your best opportunity to snap a good pic! In case you can’t tell, I’m a big fan of clear waters and the beach. The last cenote on our list was the Grand Cenote in Tulum. It checked both boxes. Even though it was a little out of the way from our drive back to our hotel in Cancun, we had to check it out (click HERE for directions). 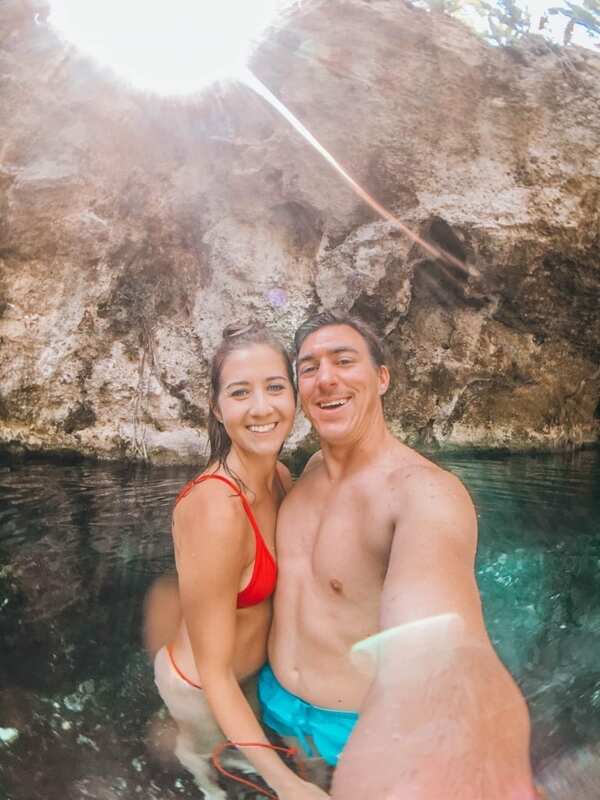 With a freshwater pool varying in depth from 4ft to 20ft, with caves going back 40ft underground, and a swim-through cave to a man-made beach, the Grand Cenote was our favorite! Similar to the Cenote Verde Lucero, there are bathrooms, chairs, tables, and lifejackets. In addition, they also have outdoor showers, lockers, and hammocks where you can bask in the warm sun in-between dips into the cenote. However, there is no food or drinks so make sure to bring your own. 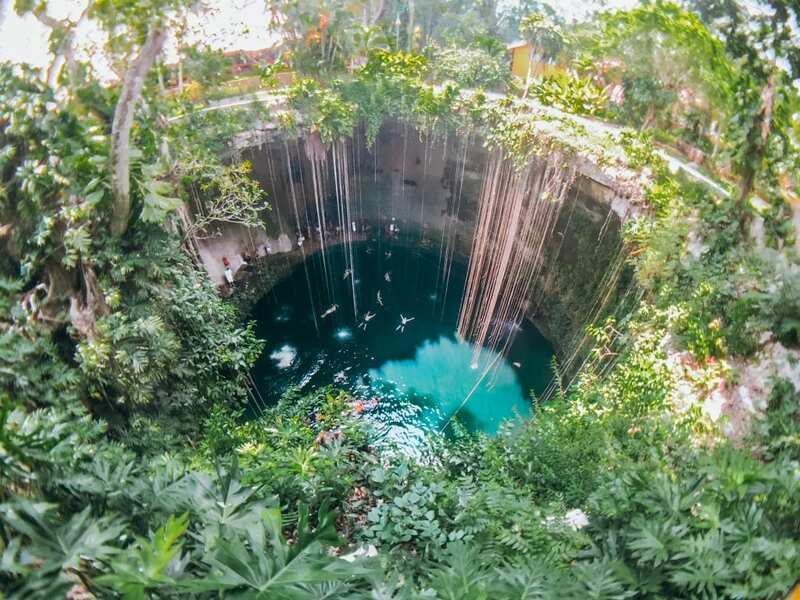 As one would guess from the name itself, the Grand Cenote is a large cenote surrounded by gorgeous jungle greenery. What makes this cenote special are the caverns that are easily accessible from inside the cenote. Unlike many cenote caverns, where you must scuba drive to even see them, here you can just swim and snorkel around to explore these wondrous caves. In most places within the cenote it is easy to touch the bottom, so it’s very easy for those not entirely comfortable with treading water to get around. TIP: Because this is a popular location, I definitely recommend going early morning or later in the day when there are less people. There’s nothing worse than swimming in a beautiful cenote with people brushing up against you or kids screaming inside the echoing caves. There are two areas within the Grand Cenote. One is the main area where the lockers and rental equipment are available. The second is a couple feet away, but out of sight. 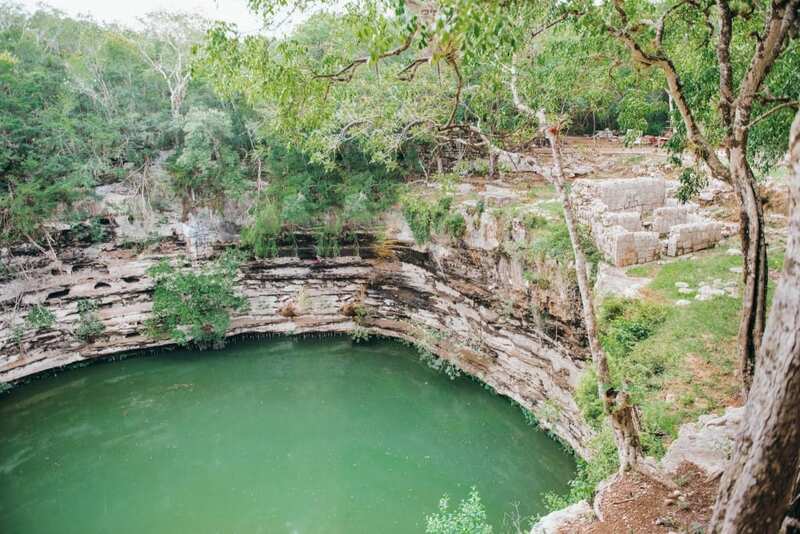 It is easily accessed by swimming to the other side of the largest cave within the cenote or walking along a small pathway with descending stairs to the right of the main area. If you cannot find it, don’t be afraid to ask one of the attendants. It may be a smaller section of the cenote, but it was my favorite part! 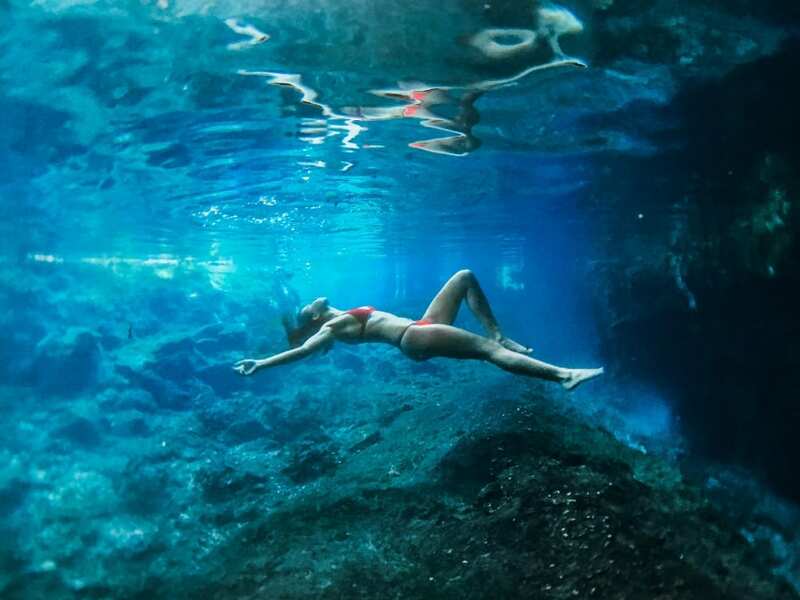 TIP: The second area of the cenote is much more photogenic, but the clarity of the water throughout the entire cenote also allows for some fun underwater shots! 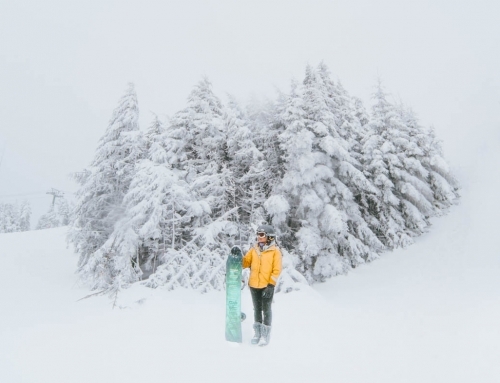 Don’t forget to bring a waterproof camera and good goggles! TIP: Check out the waterproof phone cases from HitCase. That’s what I used to get this amazing shot! We learned an extremely valuable lesson during this trip: plan your water activities early into the vacation. Snorkeling with thousands of colorful fish and rays in a coral reef, exploring two underwater art galleries (MUSA), swimming with the sea turtles in their natural habitat, and exploring a ship wreck surrounded by white sand is what we were expecting to do all day. TIP: From now on, we will plan all of our water activities for the first full-day of our vacation. This way, if we do experience some bad weather, we can postpone to another day during the trip. 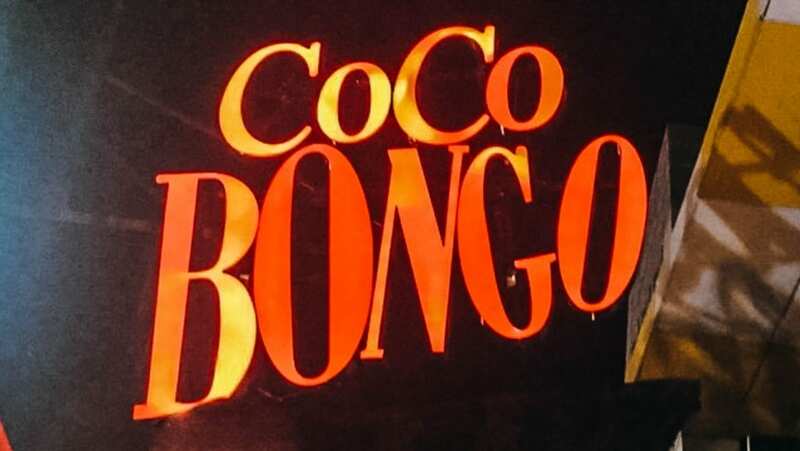 To be honest, I was a little unsure about Coco Bongo. I’m not into the club scene. I don’t enjoy being around sweaty people, having sticky shoes, or going deaf because the base is so loud. However, all the reviews I read about Coco Bongo said that this was the place to be every night in Cancun…and I now have to say I AGREE!!! In fact, it may be the only real reason why you should stay in Cancun over places like Tulum or Playa Del Carmen. Which tickets do I buy? Regular vs Gold Member. Both have the express entrance, meaning the doors open right at 10:30 p.m., and there are unlimited drinks. Now, the real difference is that Gold Members have access to actual seating on the upper level, and they receive Premium drinks (aka better brands). If you’d rather sit comfortably and sip on quality alcohol during the show, then Gold Member tickets might be more for you. This didn’t really matter to Layton and I so we went the cheapest route and bought regular. Where do I buy my tickets? You can purchase them HERE at the Coco Bongo website or right at the doors. It has an 1,800 person capacity so odds are you’ll be fine buying them right before the show starts. Why time does the show start? The show gets started at around 11:00 p.m. and goes until around 3:30 a.m.
What do I wear? There is no dress code. I saw people in suits and party dresses, while others wore shorts and t-shirts. It’s really up to you. However, unless you have bottle service or paid for the Coco Bongo Gold admission ticket, you’ll be standing the whole evening. Be smart and wear comfortable shoes. Plus, Cancun is around 80°F and at least 75% humidity on average. Add to that a room full of sweaty, dancing people and things will get even hotter. Perhaps in this kind of environment, less is more. The show itself was absolutely AMAZING! About every couple of songs, a new musical act was introduced. Some themes included Beatle Juice, Michael Jackson, Pirates of the Caribbean, Burlesque, and Rock N Roll. Each act showed how talented these performers really are. 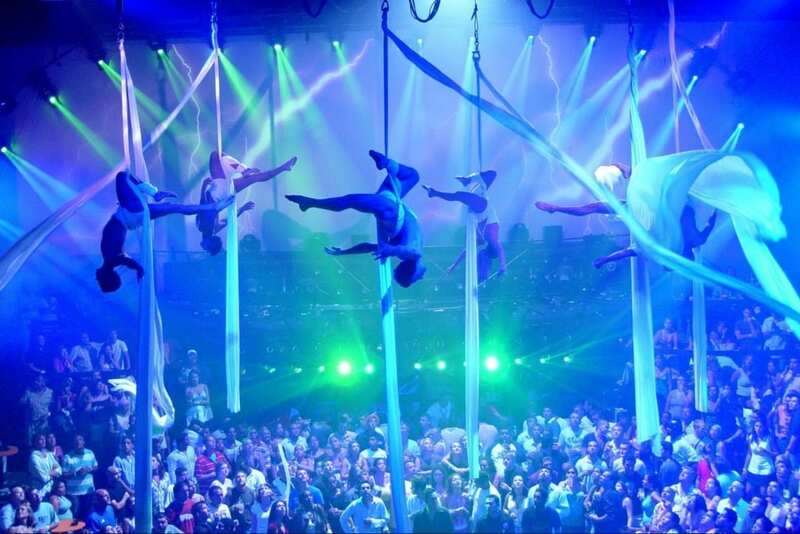 As the music blared, streamers and balloons constantly fell from the ceiling while the performers danced on stage while others swung in the air doing acrobatics. It felt like a circus and Las Vegas show all combined into one lively production. Like I said before, we are not usually into clubs and partying, but this is one event we will never forget. It’s hard to put into words what we saw, so if you’d like a glimpse into a night at Coco Bongo, watch the youtube video below. The Westin Resort & Spa, Cancun – The Westin Resort and Spa was renovating certain areas around the resort so it was cheaper than usual (which is always a plus). The hotel itself is older, but nice. Our room was very spacious and clean, the restaurants on the property had great food, and the service was wonderful. To compare different pics and packages, just search for Cancun hotels on Kayak.com and you’ll see all of the resorts. Honestly, we decided to stay at The Westin Resort and Spa because it had a decent price and good reviews. Since we would be spending most of our time exploring and outside of the hotel, staying somewhere luxurious wasn’t a priority. 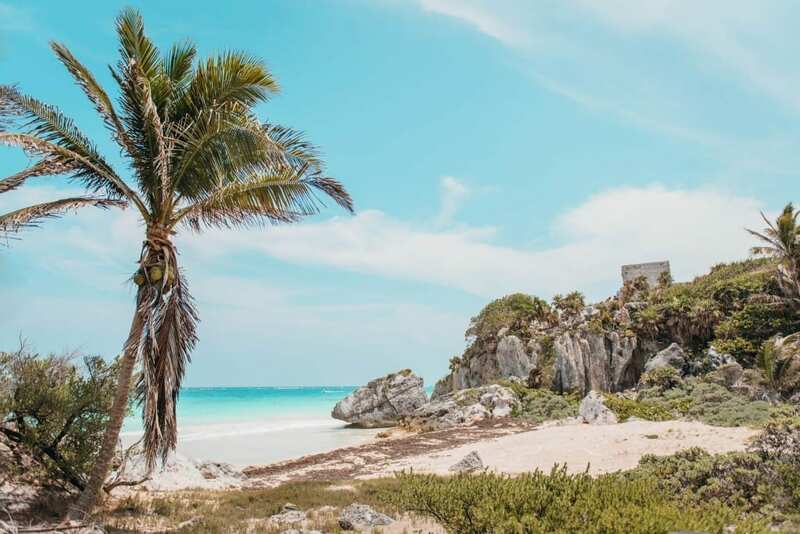 TIP: If we could do it all over again, we would stay in Tulum. While Coco Bongos was awesome, most of our trip was spent in the area around Tulum, such as the ruins and cenotes. Tulum also tends to have prettier beaches, better weather, and a smaller crowd. 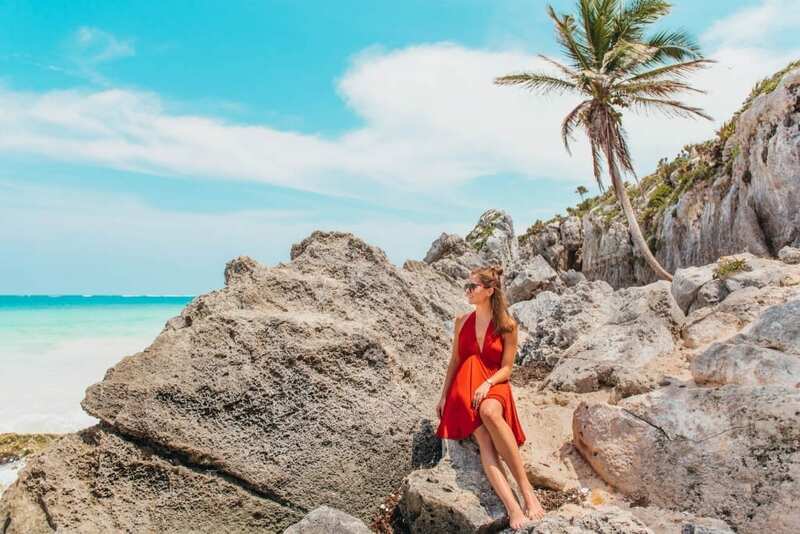 If you are renting a car, getting to Tulum is extremely easy. If you aren’t, book a hotel that has an airport shuttle service. 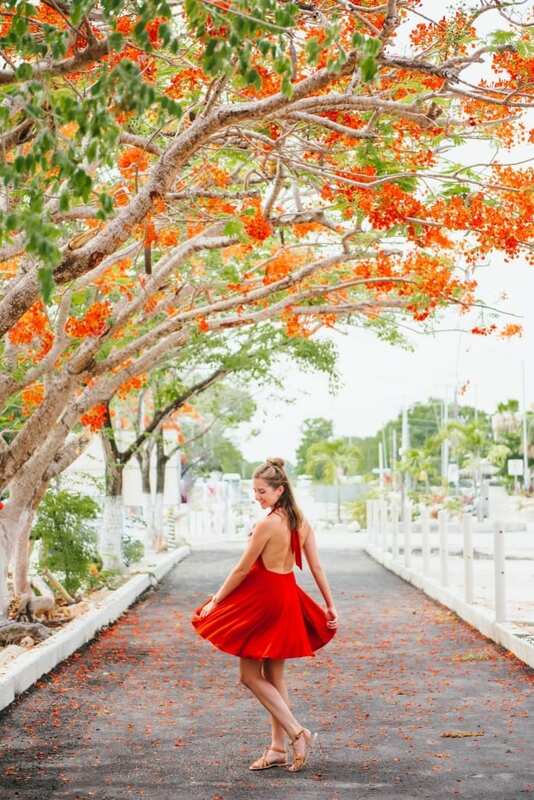 Rent a Car – The famous ruins and cenotes around the Yucatan Peninsula are usually hundreds of miles apart from each other, so the only way to see them all is by renting a car or doing a bus tour. 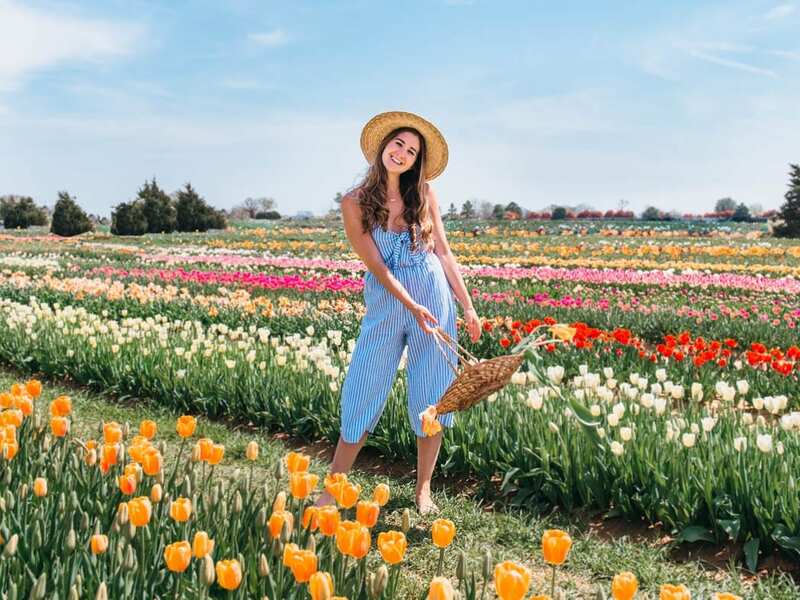 The benefit of renting a car is that it’s cheaper than the tours, plus you have the control over where you go and how much time you spend in each place. There are many rental car companies near the Cancun airport and most will provide you with a shuttle to their lots. We used National and had a wonderful experience with our Nissan March compact car. Entrance Fees – The pricing I provided you is based on the tickets we purchased at each location. However, after doing research online on the official websites of the ruins and cenotes, some of the prices are different (around $5 pesos lower). Either they have not updated their websites or they charge different depending on days. Just be aware of this. Safety – This may be a concern for you, but let me put your mind at ease. The Yucatan, in particular, is one of the safest places in all of Mexico. 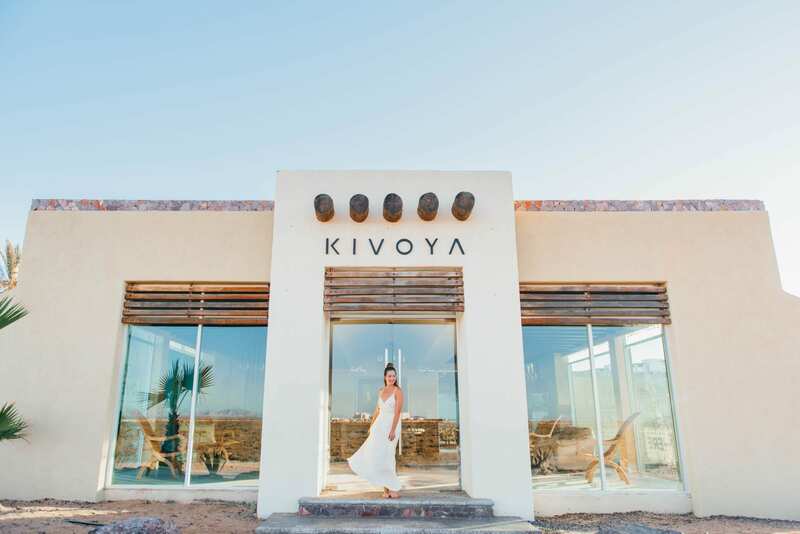 This is the hub for Mexico tourism and as such, they want to make sure there are no issues. No matter what country you are in, you should always be aware of your surroundings. However, I never felt unsafe. Whether we were walking around Cancun or driving through smaller villages around the Yucatan, we were only greeted by friendly faces and charming locals. Cash vs Card – Bring both. While most tourist locations take cards, local shops will not. If you want to buy fruit or souvenirs from the side of the road, you’ll need cash. We brought both cash and pesos and I think it was a mistake. Our local currency exchange, at the airport, gave us roughly 15 pesos to the dollar while the going price was closer to 17 pesos to the dollar. At first we thought this was just the cost of vacation, but once we got down to Mexico, the few times we used dollars to pay locals, they actually gave us a better exchange rate (closer to 16 or 17 pesos to the dollar). As long as you look up the Peso/Dollar exchange rate (HERE), you should be fine. Don’t let the locals push you into a bad exchange. They know better and so should you! What some other must-do’s? Anything else you’d squeeze into this 3-Day Yucatan Peninsula Itinerary? Let me know in the comment below! 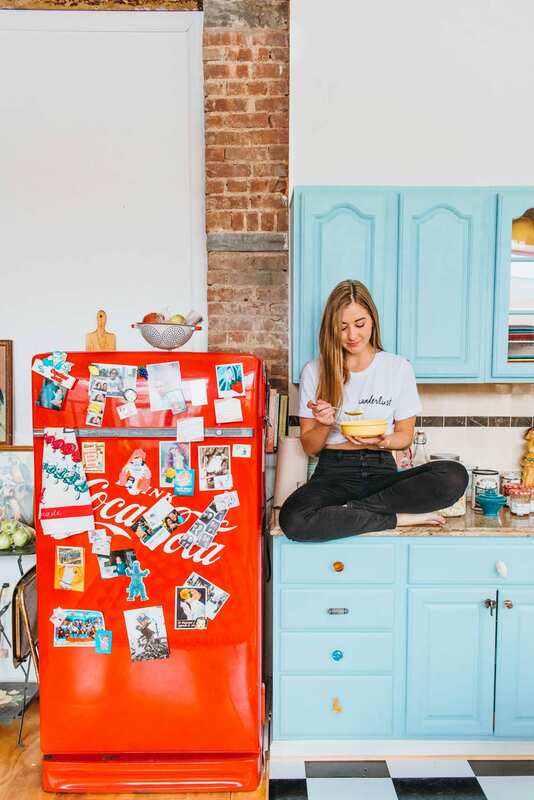 I am going to spend about five days with cousins who rented a house in downtown Cozumel and before going there I wanted to explore the Yucatan on my own. Your blog provided a really nice summary. 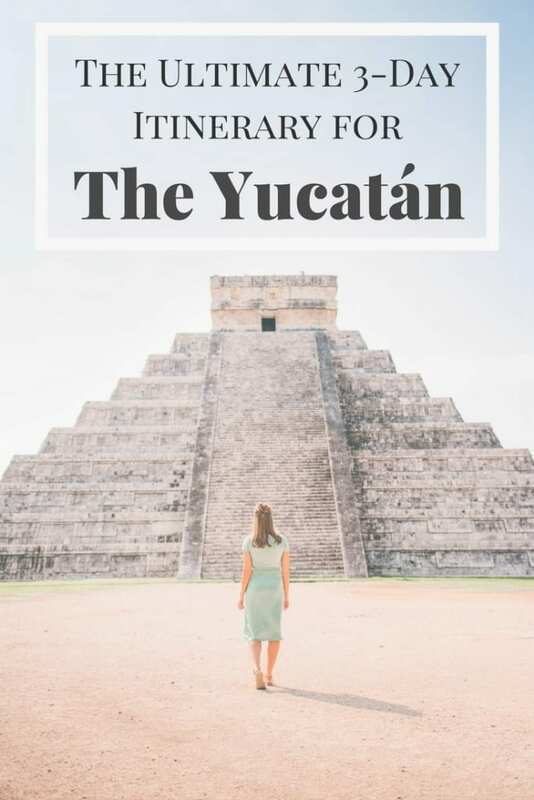 I’m a frequent work/pleasure traveler and found your comments to be incredibly helpful for planning a few days to explore the Yucatan ruins and Cenotes. I plan on avoiding Cancun all together and maybe staying in Tulum as you suggested or perhaps Playa del carmen? Any thoughts appreciated. I would definitely recommend staying in Tulum! It is more central to the amazing cenotes and ruins! Also, Cancun really is boring in my opinion unless you want to go to Coco Bongos or stay at the resort beaches. I would still recommend getting a scooter or rental car since the cenotes can be pretty far from one another and you won’t want to spend money on taxis. Wow that was unusual. I just wrote an very long comment but after I clicked submit my comment didn’t show up. Grrrr… well I’m not writing all that over again. Anyways, just wanted to say excellent blog! Thank you Sophia! 🙂 And I totally agree, you should staying longer than 3 days! There was even some things we missed doing because of that. I think 5-7 days is a good amount of time to really explore everything in the Yucatan. Wow! I’ve never been to the Yucatan but I want to go now. 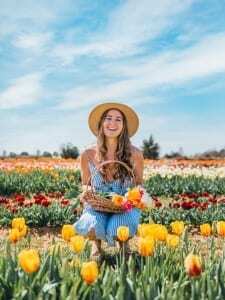 Excellant day by day suggestions and beautiful pictures. I love the “Tips” and “Directions” . Awesome! Thank you so much for taking the time to read through it all 🙂 I know if you and mom went, y’all would have such a great time! The ruins, surrounding cities, cenotes, and beaches are amazing and wonderful to explore! Fantastic! The tips are super helpful too!